1956 Chevrolet 3600 Photo Picture Classic Cars for sale & Classifieds - Buy Sell Classic Car & Classic Truck Classifieds. 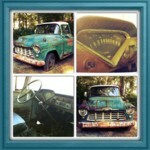 56 Chevy 3600 Series 3/4 ton left for rust. I saved her, might make a good rat rod!